Heathrow terminal 5 opened today. With a capacity of 30 million passengers a year (representing an estimated 50,000 car journeys per day), and having been under construction for over five years, you would expect it to be clearly marked on all the leading on-line maps. Hmmm… no sign of Terminal 5. 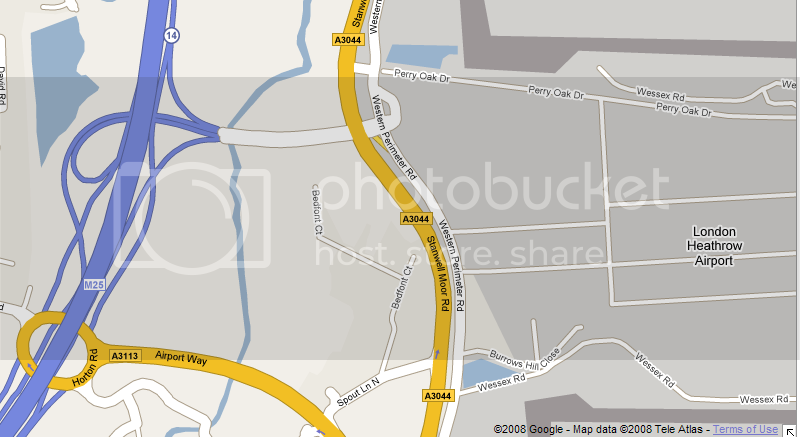 OK, the new junction from the M25 is shown and half of the spur road, but then it incorrectly becomes an ordinary road. 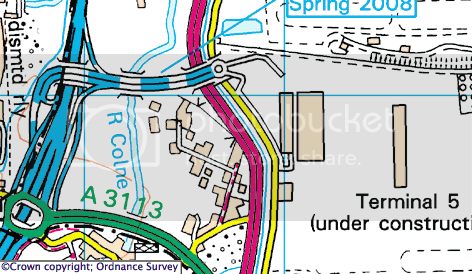 And where T5 should be the old sewage farm access roads are still showing. Really, if you look at Google Maps there’s not much of a clue where T5 is likely to be. So what about maps.live.com? No sign of T5, no new motorway spur road. Nothing. Now we are getting somewhere. The T5 terminal building is shown and the satellite T5B building. But wait! So is T5C which hasn’t been built yet. Maybe they are getting a bit ahead of themselves. 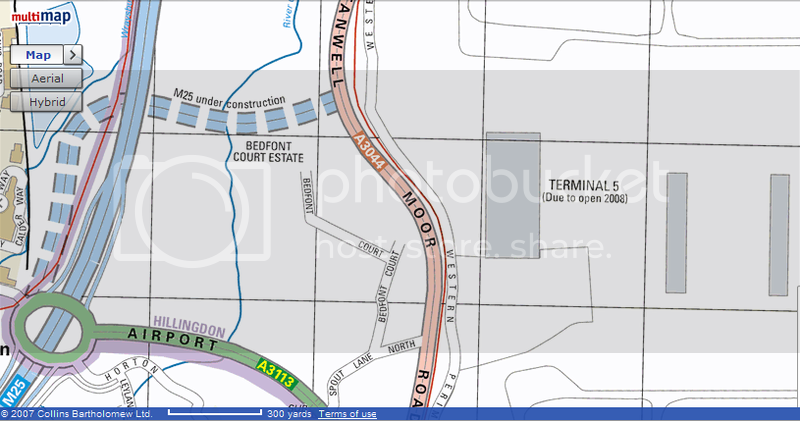 Well, maybe not, the M25 access road is still shown as under construction (even though it’s been in use by local taxi drivers for over a year) and no it doesn’t connect to Stanwell Moor Road. Oh, and if you zoom out too far T5 disappears, the link road loses it’s motorway status and the old sewage farm access roads re-appear. Oh dear. Streetmap looks promising. T5 and T5B are shown, but marked as under construction. T5C is not shown; extra marks for getting that right. The motorway spur road is shown correctly terminating at a roundabout, and the access roads into the terminal are show as stubs. Almost full marks so far. 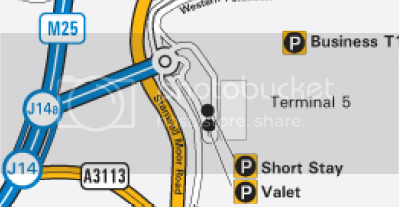 Zoom in a bit… oh dear, the motorway spur now terminates incorrectly at Stanwell Moor Road, all the local access roads are gone, and T5C suddenly appears. Arrgh. British Airports Authority are the owners of Heathrow Airport. Surely their web-site will have a decent map. Umm… no. They show terminal 5 as being reached via junction 14A. Sorry guys, there is no junction 14A. And where’s Whittle Road, the access road from the Western Perimeter Road into the southern end of the terminal building? And don’t you remember constructing T5B? Well at least you’ve marked some car parks. Just don’t expect the Automobile Association to help you find it. And finally, lets look at our own efforts in OpenStreetMap. The M25 spur road and the main terminal building are both shown. The local access roads are just stubs, but that’s understandable as there’s been no public access past these points until today. As a bonus the Piccadilly tube line is also shown. It’s not quite perfect though. The roundabout at the end of the spur road is marked as having motorway status, which it doesn’t, the T5B satellite building is not shown, and nor are any car parks. Google gets the location spot on, describing it as Heathrow Airport, Heathrow Terminal 5 (S-Bound). 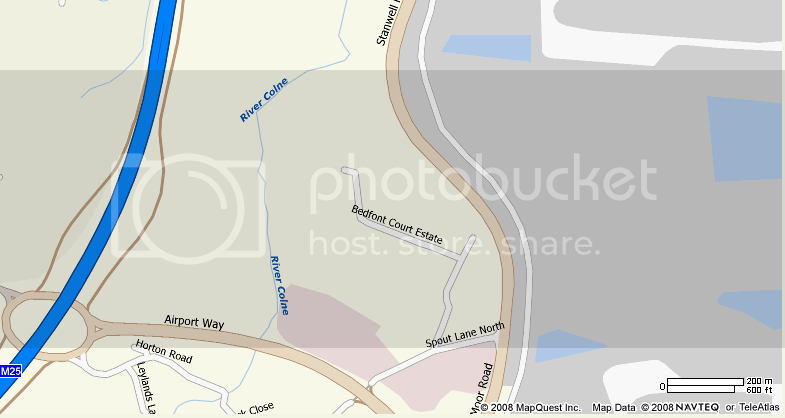 Microsoft finds the airport but locates the airside of terminal 3. Multimap finds the airport but locates terminal 4. Oddly, searching just for Heathow locates terminal 5! Streetmap says: The search returned no matches. Mapquest provides a helpful pulldown list of UK airports, sadly it only lists 4 terminals at Heathrow. The AA can help you find any terminal at Heathrow except terminal 5. 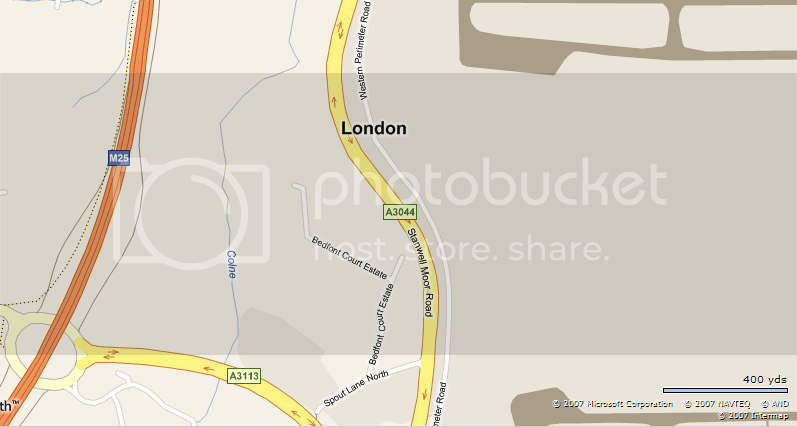 OpenStreetMap gets the location spot on, describing it as Heathrow Terminal 5. Heathrow’s terminal 5 is a major high profile new development. On it’s own it is bigger than any other airport in Europe except Frankfurt. It will generate, from today, more car journeys than a decent sized town. Yet most of the on-line mapping sites don’t seem to be capable of having a decent map ready on the day that it opens. It’s examples like this that demonstrate how well OpenStreetMap can produce accurate and timely maps. Further vindication of the effectiveness of the OpenStreetMap approach. This entry was posted in Uncategorized on March 27, 2008 by 80n. The 14B you can see on the BAA map looks to me like a badly antialiased 14a, so their map isn’t that bad. On closer inspection it does appear to say 14A, so I’ve corrected the article. But it makes no big difference, there is no 14A either. It’s all part of junction 14. Tried driving round and found so many bitty roads (all starting with W…) I couldn’t keep track without a recorder. And I wouldn’t be comfortable doing it by bike with so much police presence. So my first thought was that the commercial companies will get their act together first. 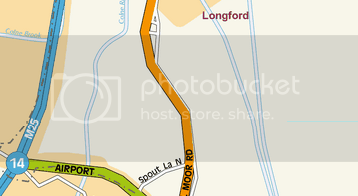 But then I saw I wasn’t the only one to add a bit of the T5 roads to osm – maybe the power of numbers really will win! I like these comparisons. It reminds me of the Haywards Heath map: http://www.refnum.com/osm/gmaps/ It seem like a very powerful illustration that a community built map is not necessarily an inacurrate map.